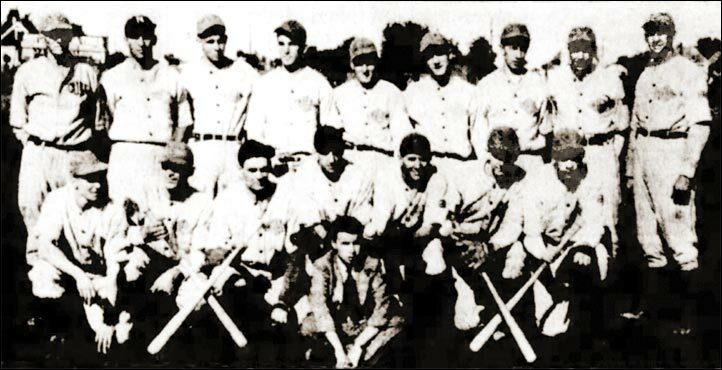 Back row (left to right) - Coach Nick Shaley, Bob Sledwitz, Allan Bolin, Pete Ezinicki, Jack Thomas, Brownie Sabo, Joe Popiel, Nick Melynkj, Manager Stan Shaley. Front row - Norman Black, Johnny Carrick, Harold Nichols, Terry Hind, Gordon England, Frank Guly, Walter Romanow. In front - Mascot Johnny Foga. Missing - Reg Sadler and Bill Ceretti.